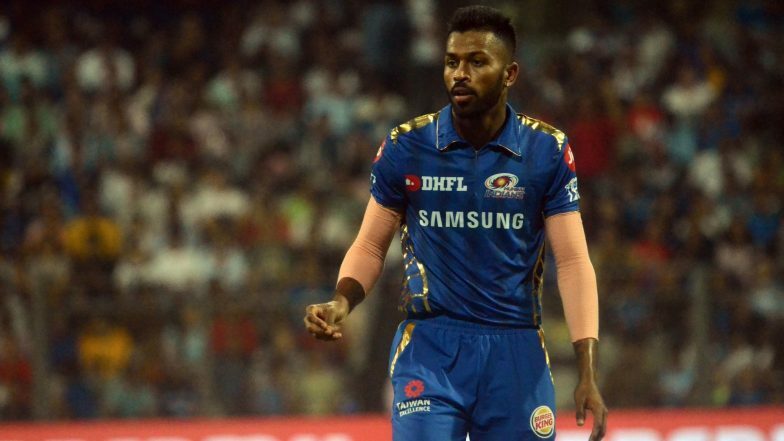 Mumbai, April 16: Mumbai Indians captain Rohit Sharma says Hardik Pandya has been driven by a desire "prove a point to himself", more than anyone else, in what is turning out to be a good IPL season for the flamboyant all-rounder. Pandya's 16-ball unbeaten 37 guided Mumbai Indians to a five-wicket win over Royal Challengers Bangalore Monday night. The all-rounder is averaging a healthy 46.50 and has a strike rate of over 190 in the eight matches he has played this season. MI vs RCB IPL 2019, Stat Highlights: Hardik Pandya’s Cameo & Lasith Malinga’s Four Wickets Handed Virat Kohli & Men With their Seventh Defeat. "His (Hardik's) hitting has been helping the team and him as well to move forward. This is something he wanted to do because he didn't have a lot of time before coming to the IPL," Rohit said after Monday's match. "So he wanted to prove a point with bat and ball, to himself more than anyone else. The way he is hitting it gives us confidence as a team that there is someone who can hit that well at the end and win crucial games." Talking about veteran Sri Lankan fast bowler Lasith Malinga, who took four wickets to restrict RCB to 171 for 7, Rohit said, "Lasith's performance matters a lot to us. We missed him for a few games. Trust me, with all that he has done over the years, bowling at the death at the Wankhede is very difficult. "Credit goes to the bowlers in general for restricting a good RCB batting line-up to 170 odd." Rohit, however, admitted that he is yet to figure out the Wankhede pitch. "To be honest, I still haven't figured out the pitch here this season. Normally it's safe to chase here, but today no one expected it to play this way. If the pitch plays like that I don't want to chase," he said with a smile. Pandya, on his part, praised openers Rohit (28) and Quinton de Kock (40) for the the start the team got in the run chase. "Hats off to both the openers. It was not easy to bat on this wicket but they made it easy for us in the end. I felt RCB didn't bowl well in the Powerplay and that's where I thought they lost the game," he said. "We began well and had the bowlers who hit the deck hard and got some purchase off the wicket. The way the wicket started playing, even AB found it difficult but they both (AB and Moeen) played well. MI vs RCB, IPL 2019, Highlights: Mumbai Indians Wins by Five Wickets. A disappointed RCB and India captain Virat Kohli defended the move to use left-arm spinner Pawan Negi in the 19th over of which Pandya smashed 22 runs to end the match. "At the end, we had to take the risk with the left-arm spinner, with two right-handed batsmen. Giving pace was risky, especially with a bit of dew. Unfortunately, it didn't come off," said Kohli. "With the ball, we weren't that great in the first six overs but the guys fought hard in the middle overs and came back well. We just have to enjoy ourselves, play the way we did in the last two games. Need to keep our composure under pressure. Need to take half-chances."